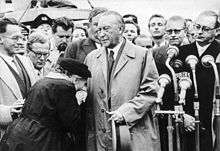 The mother of a prisoner thanks Konrad Adenauer upon his return from Moscow on September 14, 1955. Adenauer had succeeded in concluding negotiations for the release to Germany, by the end of that year, of 15,000 German civilians and prisoners of war. Approximately three million German prisoners of war were captured by the Soviet Union during World War II, most of them during the great advances of the Red Army in the last year of the war. The POWs were employed as forced labor in the Soviet wartime economy and post war reconstruction. By 1950 almost all had been released. In 1956  the last surviving German POW returned home from the USSR. According to Soviet records 381,067 German Wehrmacht POWs died in NKVD camps (356,700 German nationals and 24,367 from other nations). German historian Rüdiger Overmans maintains that it seems entirely plausible, while not provable, that one million died in Soviet custody. He believes that among those reported as missing were men who actually died as POWs. In the first months of the Soviet-German war, few Germans were captured by Soviet forces. After the Battle of Moscow and the retreat of the German forces the number of prisoners in the Soviet prisoner of war camps rose to 120,000 by early 1942. The German 6th Army surrendered in the Battle of Stalingrad, 91,000 of the survivors became prisoners of war raising the number to 170,000 in early 1943. Weakened by disease, starvation and lack of medical care during the encirclement, many died of wounds, disease (particularly typhus), malnutrition and mistreatment in the months following capture at Stalingrad; only approximately 6,000 of them lived to be repatriated after the war. As the desperate economic situation in the Soviet Union eased in 1943, the mortality rate in the POW camps sank drastically. At the same time POWs became an important source of labor for the Soviet economy deprived of manpower. With the formation of the “National Committee Free Germany” and the “League of German Officers”, pro-communist POWs got more privileges and better rations. As a result of Operation Bagration and the collapse on the southern part of the Eastern front, the number of German POWs nearly doubled in the second half of 1944. In the first months of 1945 the Red Army advanced to the Oder river and on the Balkans. Again the number of POWs rose - to 2,000,000 in April 1945. Germans POW soldiers, under Soviet guard, march in Kiev streets. A total of 2.8 million German Wehrmacht personnel were held as POWs by the Soviet Union at the end of the war according to Soviet records. A large number of German POWs had been released by the end of 1946, when the Soviet Union held fewer POWs than the United Kingdom and France between them. With the creation of a pro-Soviet German state in the Soviet occupation zone of Germany - the German Democratic Republic - in October 1949, all but 85,000 POWs had been released and repatriated. Most of those still held had been convicted as war criminals and many sentenced to long terms in forced labor camps - usually 25 years. It was not until 1956 that the last of these Kriegsverurteilte ('war convicts') were repatriated, following the intervention of West German chancellor Konrad Adenauer in Moscow. British historian Richard Overy estimated that 356,000 out of 2,880,000 German prisoners of war died in Soviet labor camps. According to Edward Peterson, the U.S. chose to hand over several hundred thousand German prisoners to the Soviet Union in May 1945 as a "gesture of friendship". Niall Ferguson maintains that "it is clear that many German units sought to surrender to the Americans in preference to other Allied forces, and particularly the Red Army". Heinz Nawratil maintains that U.S. forces refused to accept the surrender of German troops in Saxony and Bohemia, and instead handed them over to the Soviet Union. According to a report in the New York Times thousands of prisoners were transferred to Soviet authorities from POW camps in the West, e.g. it is known that 6,000 German officers were sent from the West to the Sachsenhausen concentration camp which at the time was one of the NKVD special camp and from which it is known that they were transferred to POW camps . Soviet Ministry for the Interior documents released in 1990 listed 6,680 inmates in the NKVD special camps in Germany 1945–49 who were transferred to Soviet POW camps. The West German government set up a Commission headed by Erich Maschke to investigate the fate of German POW in the war, in its report of 1974 they found that 3,060,000  German military personnel were taken prisoner by the USSR and that 1,094,250 died in captivity ( 549,360 from 1941-April 1945; 542,911 from May 1945 to June 1950 and 1,979 from July 1950 to 1955)  According to German historian Rüdiger Overmans ca. 3,000,000 POW were taken by the USSR, he put the "maximum" number of German POW deaths in Soviet hands at 1.0 million. Based on his research, Overmans believes that the deaths of 363,000 POWs in Soviet captivity can be confirmed be the files of Deutsche Dienststelle (WASt), in addition he maintains that it seems entirely plausible, while not provable, that 700,000 German military personnel listed as missing actually died in Soviet custody. According to Russian historian Grigori F. Krivosheev Soviet NKVD figures list 2,733,739 German "Wehrmacht"(Военнопленные из войск вермахта) POW taken and 381,067 died in captivity. The table below lists the Soviet statistics for total number of German prisoners of war reported by the NKVD as of 22 April 1956 (excluding USSR citizens who were serving in Wehrmacht). The Soviets considered ethnic Germans of Eastern Europe conscripted by Germany as nationals of their country of residence before the war, for example the Sudeten Germans were labelled as Czechs. These figures do not include prisoners from Italy, Hungary, Romania, Finland and Japan. The Soviet statistics for POW do not include conscripted civilians for the Forced labor of Germans in the Soviet Union. However Austrian historian de:Stefan Karner maintains that Soviet era documents indicate that 2.6 million prisoners were taken by the Soviets including 400,000 civilians. ↑ G. I. Krivosheev. Soviet Casualties and Combat Losses. Greenhill 1997 ISBN 1-85367-280-7 Pages 276-278. ↑ Edward N. Peterson: The American Occupation of Germany, pp 116, "Some hundreds of thousands who had fled to the Americans to avoid being taken prisoner by the Russians were turned over in May to the Red Army in a gesture of friendship." ↑ Heinz Nawratil Die deutschen Nachkriegsverluste unter Vertriebenen, Gefangenen und Verschleppter: mit einer Übersicht über die europäischen Nachkriegsverluste. Munich and Berlin, 1988, pp. 36f. ↑ Desmond Butler (December 17, 2001). "Ex-Death Camp Tells Story Of Nazi and Soviet Horrors". New York Times. ↑ Stefan Karner. 2015. Der "französische Spionagering" in Rostock und die sowjetische Staatssicherheitsakte zu Wilhelm Joachim Gauck. In: Andreas Kötzing ed. Vergleich als Herausforderung. Göttingen: Vandenhoeck & Ruprecht, p.171.